The WMI allow you to get the installed Antivirus, AntiSpyware and Firewall (third party) software using the root\SecurityCenter or the root\SecurityCenter2 namespaces and the AntiVirusProduct , AntiSpywareProduct, FirewallProduct classes. First you must know which these classes and namespaces are not documented by Microsoft and only are supported in Windows Desktops editions (Windows XP, Windows Vista and Windows 7). 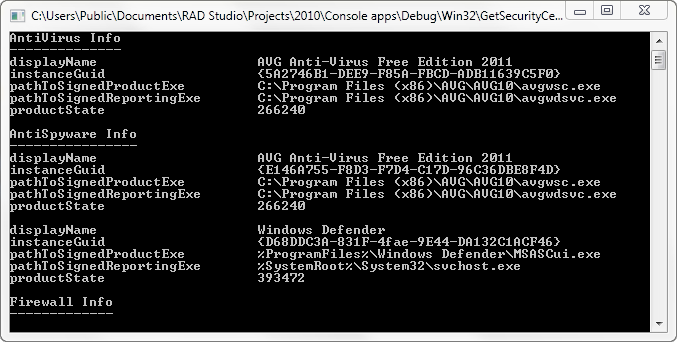 This is a sample project which determine the Antivirus, AntiSpyware and Firewall software installed in the system. //verifies that the application is running on Windows 2000 Server or a later server, such as Windows Server 2003 or Windows Server 2008. And here is the result of the app. very good to have Delphi coming back to scene with this beatiful code. Simply delicious. in rest the example works like a charm. Radu, thanks for your comments. the code provided was tested in delphi 2007 and XE, thanks for include the missing records and consts in delphi 7.
ninguna clase que utilizar, por lo demas como decia esta fantastico. Asi es la clase AntiSpywareProduct no esta disponible en Windows XP. que significa “product state” 393472? como se si esta activo o no y puede interferir en mi instalador? Hi, I can not see anything for firewallinfo on my Windows7 computer. The built-in windows firewall enabled. Does any trick exists that I am missing? Best regards. Are you using the exact same code of the article or your modified the code? Yes and also I tried with a fresh code generated via wmi code creator. Via the netfirewall com interface I can get the firewall status. I’ve developed a Delphi web server that allows the users to upload files; in order to keep the server free of viruses, I’d like to check every single file the users load. Is there a way to call the “file scan process” of the default antivirus by using WMI ¿? There is not a WMI class to launch the installed antivirus, for this you must use the IAttachmentExecute.Execute (http://msdn.microsoft.com/en-us/library/bb776297%28v=VS.85%29.aspx) method this can run the virus scanners or others trust services to validate the file before executing it. Note that this method can delete or alter the file. Why this can only run in desktop operating systems? Hi Cesar, Because these WMI classes are only present in the desktop editions of Windows. Do you know if there is a way to retrieve antivirus information in windows server? I’m sorry but I’m not aware of any API to retrieve the antivirus info in the Windows Server.